Pinpointing the exact cause of breakouts is like trying to solve a mystery, especially when acne triggers are different for each person. While it’s true that many skin experts say the cause of acne is unknown, certain foods have been linked to causing or worsening blemishes.We’ve already identified 8 of the major foods that cause acne. Here, we’ll add onto that list and detail a few more foods that are pimple culprits, but first, let’s take a look at why certain foods can cause acne in the first place. From a holistic perspective, acne is an inside job—meaning the condition of your skin is a reflection of the state of your internal environment. You see, acne is a sign of toxicity in your body. And according to Traditional Chinese Medicine, the presence of acne can also mean that something is out of balance with your digestive health. First off, your liver is responsible for filtering toxins out of your body and eliminating them through digestion. But in addition to detoxification, your liver has close to 500 other functions to perform. When your liver is overburdened with toxins, it can become sluggish and detoxify less efficiently. This is when toxins can begin to get eliminated through other channels, such as your skin. These toxins can lead to breakouts. Your liver is also responsible for maintaining the balance of certain hormones, such as estrogen. However, a sluggish or overburdened liver may not be able to regulate hormones as efficiently (1). This can result in an hormonal imbalance, which is a common underlying cause of acne. While there’s limited scientific research on estrogen and acne, it’s suggested that excess estrogen is linked to cystic acne near the chin and jawline (2). In fact, many acne sufferers—including myself—who have acne as a result of excess estrogen credit removal of phytoestrogenic foods and taking an estrogen-blocking supplement with clearing up cystic acne. It should also be noted that because estrogen and progesterone are needed together in a specific ratio, too little progesterone can also cause estrogen dominance, even if excess estrogen isn’t present in the body. Imbalances in hormones like estrogen, progesterone or insulin can cause acne. Another hormone that plays a huge role in acne is insulin. Insulin, the hormone that regulates blood sugar, is overproduced when we eat too much refined sugar. Excess insulin production has been shown to cause excess sebum (or oil) production, which can clog your pores and form pimples (3). Now, when insulin is constantly being overproduced, the body eventually becomes “worn out” from repeatedly releasing this hormone, and stops releasing an adequate amount to help regulate blood sugar. In other words, insulin becomes “resistant” to the sugar you’re eating, and the sugar begins to build up in your bloodstream. When this happens, a serious hormonal imbalance called insulin resistance, or type 2 diabetes, results (4). 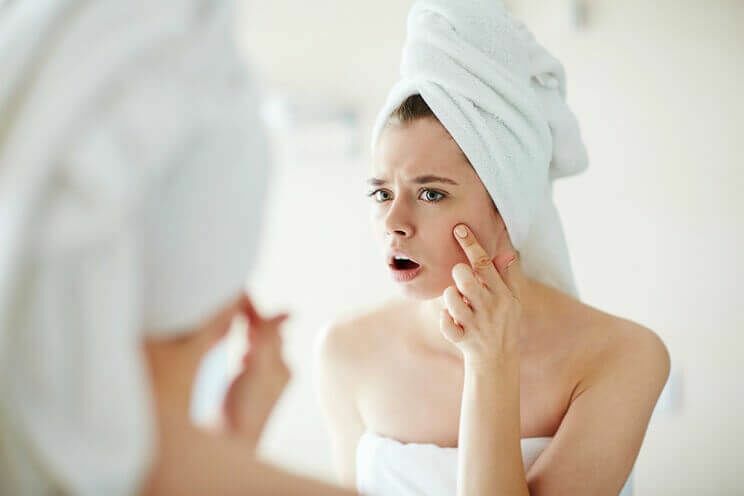 Since it’s estimated that more than 29 million Americans are diabetic or prediabetic, there’s a possible link here as to why hormonal acne is becoming more common in today’s society (5). A lack of beneficial bacteria in your gut can also play a role in skin breakouts. A study done on the treatment of small intestinal bacterial overgrowth (SIBO) showed that improving gut health simultaneously cleared up skin lesions and acne rosacea (6). This study also showed that cases of acne were higher in patients who had SIBO compared to the control group, suggesting that a link exists between the condition of the gut microbiome and the skin. The beneficial bacteria in your gut have also been shown to improve liver function (which helps support your body’s natural detoxification process) and play a key role in preventing a condition called leaky gut. Leaky gut is a cause of systemic inflammation, which may contribute to inflammatory skin conditions such as acne. (7). If you haven’t heard of it before, leaky gut is a digestive condition, also known as intestinal permeability. Leaky gut occurs when food particles, toxins and other substances slip through the tight junctions in your small intestine. You can think of leaky gut in your intestinal tract as something similar to the holes in a cheesecloth, where small particles are able to slip through. Under normal circumstances, undigested food particles aren’t supposed to leave your digestive tract. So when these bits of undigested food “escape” your gut and enter your bloodstream, your immune system will see these foreign invaders, attack these substances, and elicit an immune response.Immune responses can trigger acne breakouts because they promote inflammation in the body, and acne is an inflammatory condition (8). By understanding the different ways digestive health is linked to the condition of your skin, it’s also easier to determine why certain foods can cause breakouts. For example, the worst foods to eat for clear skin are those that deplete healthy gut bacteria, creating extra work for the liver. Foods that deplete healthy gut bacteria can lead to acne breakouts. It should be noted that the research on acne-causing foods is limited and can be inconsistent. While many people experience an improvement in their skin when removing potential acne culprits, the root cause of acne will be different for each person and may not be limited to certain foods. Acne may be a symptom of a deeper health issue that requires healing, such as candida or yeast overgrowth. With that said, if you eat any of the foods listed below in high amounts and experience regular breakouts, you may want to try eliminating one food from your diet at a time for a minimum of 3 weeks to see if you notice an improvement in your skin. To determine which foods may be causing your skin to breakout, track your symptoms by keeping a “food and skin” diary. Writing down what you’re eating when breakouts occur and when you notice an improvement in your skin can help connect the dots between certain foods and acne quicker. As a general guideline, here are the most common foods that cause acne and what to eat instead. It’s unclear exactly why nuts cause breakouts for some people, but it could have something to do with the high omega-6 content. All nuts contain omega-3 and omega-6 essential fatty acids, and we require both in a specific ratio for optimal health. The ideal ratio of omega-3’s to -6’s we should have in our diet is 1:3. However, the foods in the Western diet have many of us consuming a ratio of 1:17 (9). This is a problem because omega-3’s are an anti-inflammatory nutrient, while omega-6’s promote inflammation in the body when consumed in high amounts. And as you now understand, acne is an inflammatory condition. 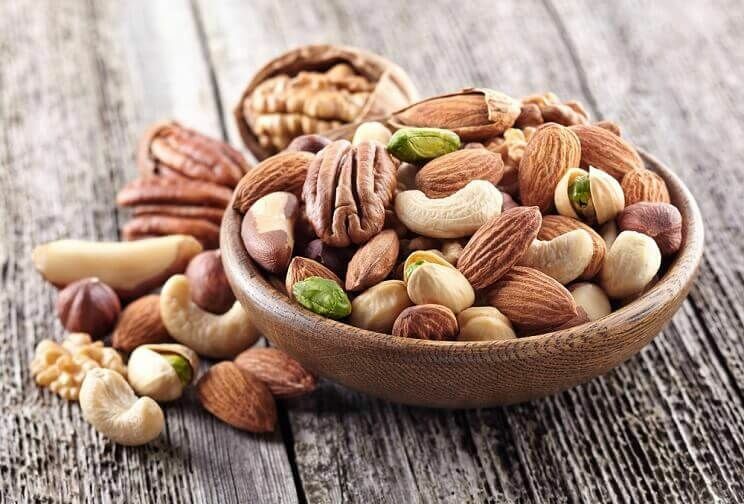 Nuts, one of the foods recommended on a Paleo diet, are also a great source of antioxidant vitamins and minerals that can support the general health of the skin and liver. For this reason, you may not want to avoid nuts completely—just those that are higher in omega-6’s. Avoid nuts like walnuts, pine nuts and almonds if you’re prone to acne breakouts. The nuts with the highest omega-6 content include walnuts, pine nuts, almonds and Brazil nuts, which mean they’ll raise your omega-6 ratio and are more likely to contribute to inflammation and acne. The nuts lowest in omega-6’s are macadamia nuts, cashews and hazelnuts, which make them a better choice for keeping your omega-3:6 ratio in check. Take a look at this article for further information about nuts and omega-6 fatty acids. If you want to eliminate nuts from your diet altogether, replacing nuts with seeds will still ensure you’re getting a good source of omega-3’s from your diet. Hemp hearts and chia seeds are both a rich source of omega-3 essential fatty acids, and can help rebalance your omega-3:6 ratio, which may lead to clearer skin. Refined sugar causes many health problems, and acne is said to be one of them. As mentioned above, refined sugar causes rapid spikes in your blood sugar levels, which causes your pancreas to release the hormone insulin. It should be noted that refined sugar isn’t the only culprit in blood sugar spikes. Any high glycemic food (such as alcohol and white flour) has the potential to trigger excess sebum production. 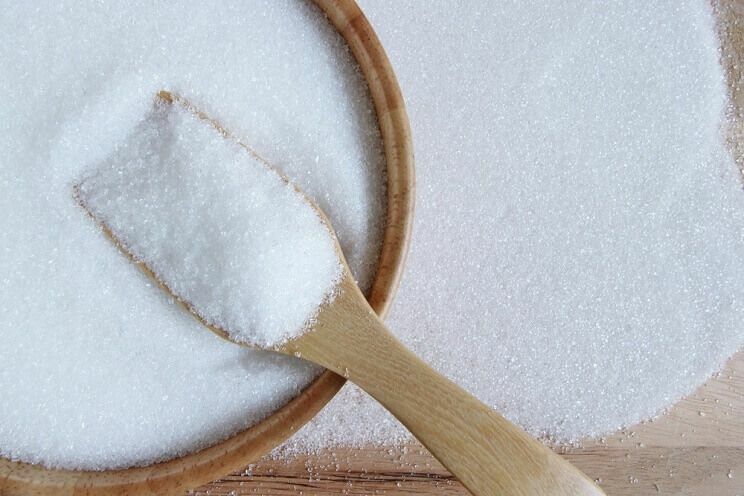 Let’s not forget that refined sugar goes by many aliases, such as high fructose corn syrup, cane sugar, cane syrup and brown rice syrup, to name a few. While refined sugar isn’t permitted on a Paleo diet, low glycemic, natural sweeteners are. Coconut nectar, pure maple syrup, coconut sugar and green leaf stevia are natural sweeteners that can replace white sugar in your diet. 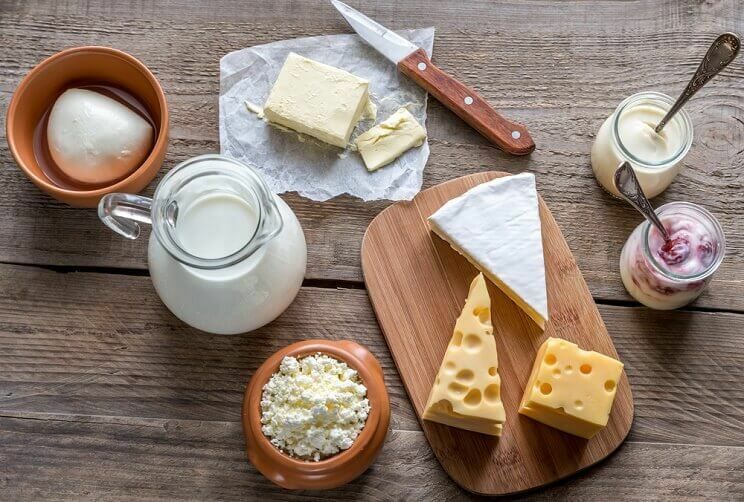 Dairy is a common hidden food sensitivity and causes digestive problems for many people. This is because some of us stop producing the enzyme lactase after the ages of breast feeding. Lactase is the enzyme needed to digest lactose, the milk sugar found in dairy products. When your body can’t properly digest a certain food, it can begin to ferment in your GI tract and promote the overgrowth of bad bacteria. As previously mentioned, an overgrowth of bad bacteria is linked to acne because it depletes your beneficial bacteria and contributes to conditions such as leaky gut and candida. Rich, high fat foods such as cheese may also trigger excess sebum production, which leads to acne. Luckily, eliminating dairy from your diet is easy thanks to nut and seed milks. Unsweetened almond milk, cashew milk, hazelnut milk and coconut milk are all ideal alternatives to cow’s milk, but, as with most foods, should be consumed in moderation. It’s estimated that 18 million Americans are sensitive to gluten, and not all of them know it (10). As a common food sensitivity, gluten is linked to acne the same way dairy is. Gluten is a protein found in grains (such as wheat, spelt and kamut) that some people have difficulty breaking down. Another huge problem with gluten is that it can also impair zonulin function. Zonulin is a protein which has a direct link to leaky gut. In fact, it’s often referred to as the “doorway” to leaky gut syndrome. You see, zonulin helps regulate intestinal barrier function—but when overproduced, it opens up the space between the tight junctions in your intestines. This is how zonulin contributes to causing a “leaky” gut (11). 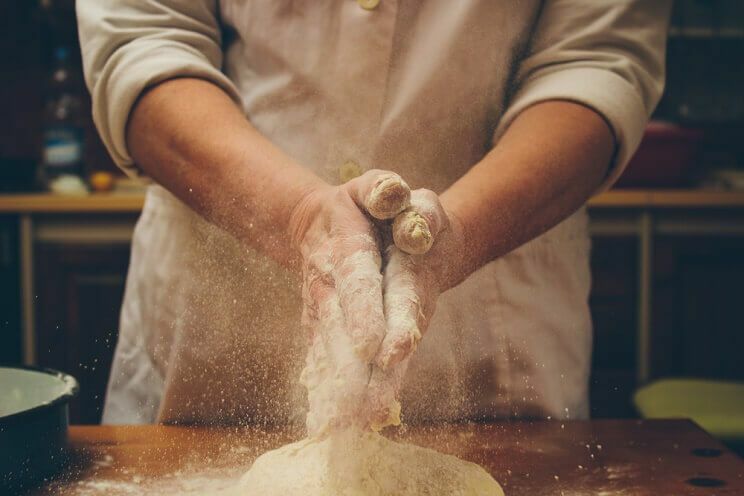 Gluten impairs zonulin function, a protein that leads to leaky gut. And as you now understand, the harder a food is for the body to digest, the more likely it is to cause fermentation, an overgrowth of bad bacteria and poor gut health—all of which are linked to acne. A Paleo diet is naturally grain- and gluten-free, with some of the best alternatives to grains being zucchini noodles, or “zoodles,” coconut flour and sweet potato slices, which can be used to make toast. Just as humans produce the hormone estrogen, plants produce phytoestrogens. These phytoestrogens can play an important role in human health, but because they mimic the hormone estrogen, they may also contribute to hormonal imbalance when consumed in excess. As previously mentioned, estrogen is a growth-promoting hormone which is suggested to contribute to cystic acne when out of balance (12). It should be mentioned, though, that this is only a potential problem for conditions where estrogen dominance is present, as estrogen itself doesn’t cause acne. It’s too little or too much estrogen that can contribute to symptoms of hormonal imbalance. 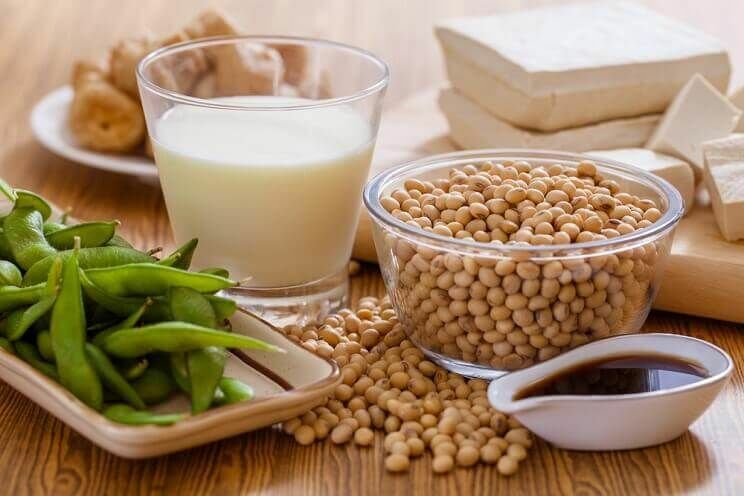 While soy is thought to be a good source of protein, organic, grass-fed meat offers more protein than soy, in addition to other skin supportive nutrients, such as omega-3 essential fatty acids. There are also many healthy, Paleo-friendly sources of protein that aren’t meat including chlorella, sea vegetables and eggs. Remember how we recommended replacing soy with organic, grass-fed meat? Keep in mind that the quality of the meat makes all the difference to your health. Research suggests that over-consuming conventional animal products that have been treated with growth hormones (such as estrogen) may contribute to hormonal imbalance (13). 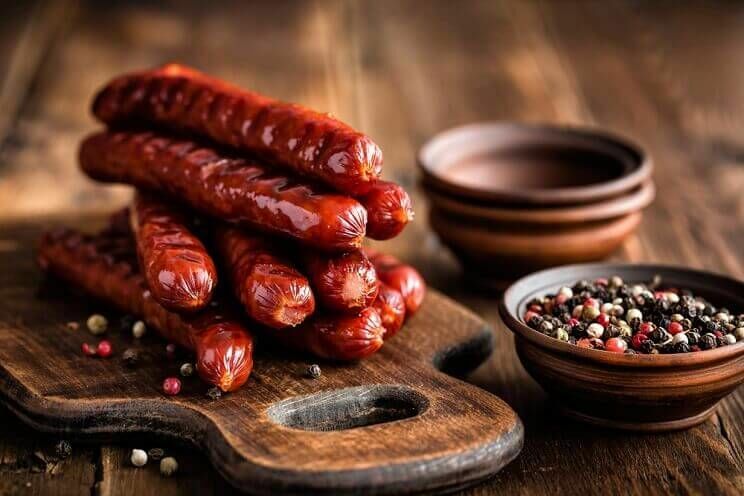 Since hormonal imbalance is a cause of acne, this suggests that consuming large amounts of non-organic meat may be linked to acne breakouts if it’s treated with growth hormones. Consume organic, grass-fed meat that’s hormone-free, and focus on eating a balanced diet filled with vitamin- and mineral-rich foods, such as fruit, vegetables and leafy greens.